12. Attach yarn to next free st on base circle to the left of previous point using the pull through loop, ch1, sc in same st method. sc in next 5 st, ch1, turn (6) and repeat steps 7 to 11. 15. With colour A, repeat steps 1 through 14. 16. Using colour A, thread tapestry needle. Starting at the top of a point, sew wrong sides of each star together by stitching through the front loops only of each side. Ensure all loose ends are tucked in side stars as you go. 17. When only one ‘valley’ remains, stuff star well, then continue sewing both sides together till end. 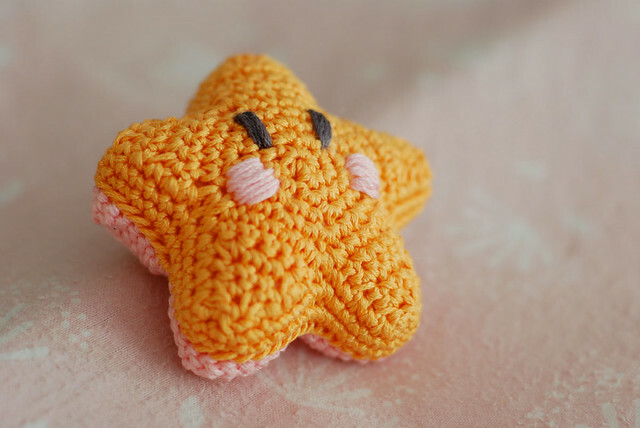 Weave in ends, and finish manipulating star into the desired shape – pressing into the middle of the bottom to give it a slightly concave look. 18. Thread tapestry needle with colour C, and embroider in eyes vertically. 19. Thread tapestry needle with colour B, embroider in cheeks horizontally. * If using optional stitch marker, place it at the start of rows 2 through 5. 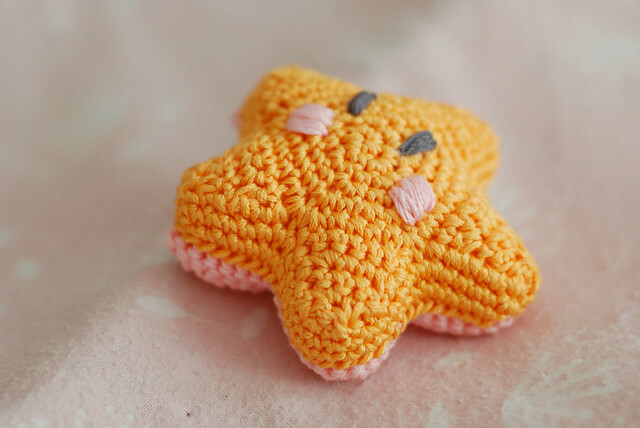 *** If you’re feeling a rich, stuffing the star front and back with the same yarn you used to crochet it will help disguise any errors/differences in gauge/tension. *** Stuffing this star with pvc pellets would mean it would double as a paperweight. BUT would also render the project no longer safe for children. **** Please don’t replicate/reprint this pattern, nor claim it as your own. Rather, link back to this page/site instead. Thankyou! thank you so much for this pattern is so cute! How do I acquire permission to sell these cute little sea stars to benefit the (Port Angeles, WA) Feiro Marine Life Center’s research on the disease that is currently killing sea stars? I have a small adaptation. When I made one for my granddaughter, she wanted it to have a nose.